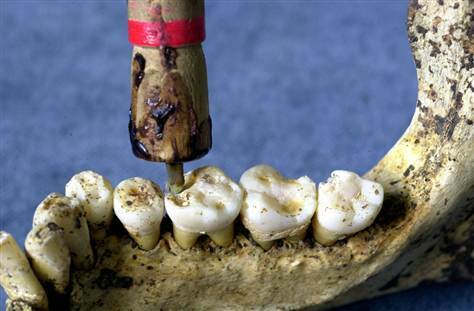 Since prehistoric time man strived to replace teeth that were lost due to trauma or severe periodontal disease in an efficient way. In fact, the loss of a tooth may involve functional and psychological consequences and noticeably reduced the quality of life of an individual. The first materials used consisted in the fruit of the human intelligence and nature produce. The first teeth were manufactured adapting raw materials such as shells or small stones or by carving them from wood. It was only many centuries later, in the industrial area, the new technologies and techniques were develop to replace missing teeth. Most of the efforts were aim to rehabilitate the partially or totally edentulous patients, in order to provide him/her of function and self-esteem. The advent of the osseointegrated dental implants, as we know them today, established a new era and gave some valid treatment options for this overwhelming problem. 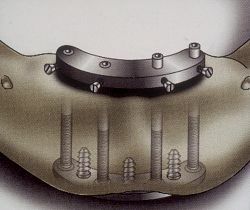 Numerous attempts were done to try to stabilize dentures in the mouth of the edentulous patients, sometimes more or less successful, and several options (some of them are still used today) included the implantation in the patient jaws of the most various type of devices in order to create a stable anchorage for dental prostheses. One of the technique consisted in the implantation in the jaw of the patient of the so-called “subperiosteal implants”. These type of implants consisted in a crome-cobalt metal framework, shape to fit the edentulous ridge, that was inserted in an artificial space created between the periosteum and the alveolar (or basal) bone. Long term reports on these type of implants were published by Bodine in 1974 and Young in 1983. In these two papers the authors reported their experience, in the form of a case series,including the percentage of success and complications. These studies are rather confusing as far as design and report of the results, and contain several biases, but are of a marked historical value. In fact it is only thanks to the intelligence and dedication of researcher and clinician such as Bodine and Young that the technology and techniques could progress and lead to the knowledge that we own today. The sub-periosteal implants did not show positive results (compared to today’s criteria), but were used in the absence of better alternatives for treatment. To overcome the limitation of this type of implants, the development of alternative treatment options continued, and some of these are still used today, such as: the transmandibular implants (as described by Bosker 1991) and the plateform implants (Roberts 1996). At this point in history of dentistry, dental implants used for the anchorage of prostheses, did not have a honorable reputation most likely due to the high percentage of complications and the catastrophic kind of failure. Also, the surgical and prosthetic techniques used for the fabrication of this artifacts required and extensive training and experience and was confined to the used of the most excellent clinicians. It was only a matter of time before an efficient alternative would be discovered, and it eventually happened. The door into the world of implant dentistry, as we know it today, was firstly opened by PI Brånemark and his research team in Goteborg, Sweden. It was an accidental discovery that lead to the development of the modern osseointegrated dental implant. The key to his success was the material used for this kind of implants, or as he calls them, fixture. The material in question is titanium. Titanium has the property of being biocompatible, thus could be implanted in the human body, and specifically in the bone (that is why this kind of implants are defined endosseous), without generating a chronic inflammatory or allergic response. The design of the first fixture is totally different from the one we know today, in fact it resembled the shape of a saddle that overlapped the alveolar ridge and was kept in place by a transalveolar screw. This design was finally replaced by the screw-shaped fixtures that provided better results and more prosthetic options. One of the multiple aspects that brought the Goteborg group to be the world leader in dental implants and rehabilitation of the edentulous patients, is not only the development of a new successful technology and the discovery of titanium as biocompatible material, but is the scientific approach to the investigation of this new modalities of treatment. The Swedish group had, in fact, to present their highly encouraging results in front of a scientific community that considered implants as a highly unpredictable, empirical procedure, full of complications, and confined it in the hands of a few. Their approach was highly scientifical, and based on concept that today we defined “evidence based dentistry”. At a more or less contemporary time another group, in Switzerland, lead by Schroeder, was also working on osseointegration, although using a different rationale and different modalities of treatment. It is, therfore, interesting to review some of their clinical studies that introduced the concept of using endosseous implants as anchorage for a dental prosthesis. It was in 1969 that Brånemark and his group presented the first clinical study on osseointegrated fixture for the anchorage of dental prostheses. As previously mentioned, in the 70’s the public opinion was somehow reluctant to accept dental implants as a valid treatment option for the edentulous patient, due to the poor success rate reported in the few clinical studies published. The author, with this publication, wanted not only to present his clinical and research findings, but also set a marked distinction between the osseointegrated fixtures and any other type of dental implant. When this study is analyzed under the current standard, many biases could be pointed out, but it’s important to understand that at the time of publication, the standard were different and find the level of evidence that they provided was extremely uncommon for any other dental treatment. 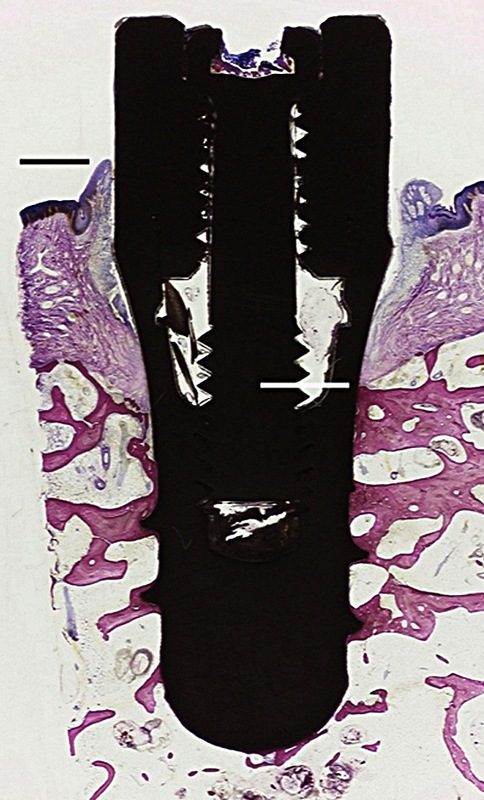 This article presented a review of the in vitro findings, as well as the development of the dental implants in a very similar form to how we know them today (screw-like shape). The authors did not omit to report the complications and failures that they experiences with this kind of fixture. Some of the explanations that they provided to justify the occurrence of failures are still very contemporary and also apply to the modern dental implants. The authors suggested that trauma during the surgical phase retarded bone healing and suggested to use a non traumatic technique. Also, the prosthetic design and loading time influenced the success of these fixtures and guidelines on the prosthetic restoration were provided. Numerous studies followed this initial publication, reporting longer and longer follow-up time as well as more patients treated with osseointegrated fixture. Some of the limitations of the published studies were a lack of randomization and blind evaluation, as well as some biases created by the continuous development of the technique (patients were treated with different protocols). One of the most positive aspect of these publications was the clear and repeatable success/failure criteria adopted for the long term evaluation of the Brånemark system. Somebody may argue that this criteria were tailored to match the outcome reported in the clinical setting (such as the 1.5mm of bone resorption) and did not include the prosthetic part of the treatment, but we have to consider that this criteria were way stricter than what the scientific community used at that time. It was almost during the same years that the group of Schroeder started to work on their modality to achieve osseointegration. The first publication, in english language, arrived several year after the Swedish group, but encouraging and promising results were already published in German language in the 70’s. The concept of treatment of the Bern group was radically different from the Swedish one. In fact, they developed a slightly different shape of dental implant that included a trans-mucosal component. Originally this implant were in shape of a basket, later replaced by screw shaped implants. 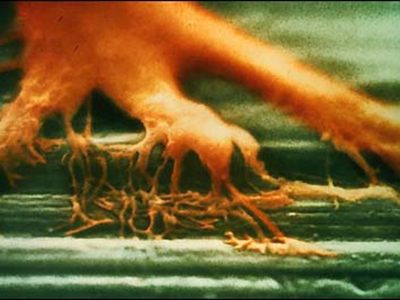 In a similar way to the Swedish group, Schroeder supported his research with a solid base of in vitro evidence matched by long term clinical results. Both type of dental implants are widely used today in the treatment of partially and totally edentulous patients. Almost one million dental implants are inserted per year, and the world-wide success of this modality of treatment is due to the effort and dedication of investigators such as P.I. Brånemark and A. Schroeder.